Japanese Hakata ningyo, unglazed clay doll of a young samurai (wakashu) with a dancing fan. 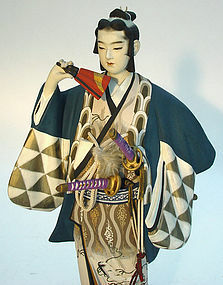 This doll may have been modeled after a character in Kabuki (played by all males) or Takarazuka (played by all females). There were many play houses in Hakata during the late Meiji, Taisho and early Showa period. The Takarazuka theater (Fukuoka Takarazuka?) was also there. Live theater play was quite popular before play houses and theaters went through destruction in the form of fires, bombing or simply becaming too old. There is a label on the back of the stand which indicates the name of the store in Hakata with a 4 digit phone number. This doll was probably modeled after a theater character in the early reconstruction time after the war, 1950s to 1960s. Two swords made out of wood and a partial fan (red top area) made out of clay are removable. Artist signed. 15" tall (doll is 14 1/4", stand 3/4"). Dimensions of stand: 9 1/8" x 7" x 3/4"